Bilva leaves, or the Belpatra, are an important item while worshipping Lord Shiva. But it is difficult to get unbroken and fresh bilva leaves. So now, people have started using Silver Bilva Patra and Mala. Here are the benefits and how to do puja with silver bilva leaves? Silver Bilva leaves have all the benefits of offering natural leaves. It is believed that the present of silver bilva patra will make sure that there is positive energy in the house. It is believed that offering water and silver bilva patra daily will help in sin redemption. Reusing the same bilva patra is helpful to nature too. How to do puja with Silver Bilva Leaves? When Shiva puja is done at home, after offering water, silver bilva leaves should be offered to Shiva. The silver bilva leaves should always be kept neat and clean. After the puja the leaves should be cleaned properly and kept in a safe place. It should not be taken out or shared with others. Keep it in the puja area near the photo of Shiva. Placing bilva leaves near the main entrance of the house will help in keeping out all kinds of negative forces. 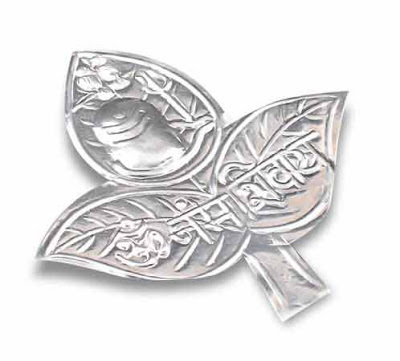 Shravan month is ideal of bringing Silver bilva leaves mala or silver bilva leaves.